Founded by celebrated goldsmith Nicole Landaw, Kid Jeweler was inspired by the idea of transforming the creativity and loving marks of your growing kids into precious treasures you can keep forever. The Kid Jeweler experience is a collaboration between designer (your kid), fine jeweler (Nicole) and the most cutting-edge jewelry technology available. The result is stunningly personal, custom jewelry you’ll be proud to wear and gift. Founded by celebrated goldsmith Nicole Landaw, Kid Jeweler was inspired by the idea of transforming the creativity and loving marks of your growing kids into precious treasures you can keep forever. The Kid Jeweler experience is a collaboration between designer (your kid—or you! ), fine jeweler (Nicole) and the most cutting-edge jewelry technology available. The result is stunningly personal, custom jewelry you’ll be proud to wear and gift. 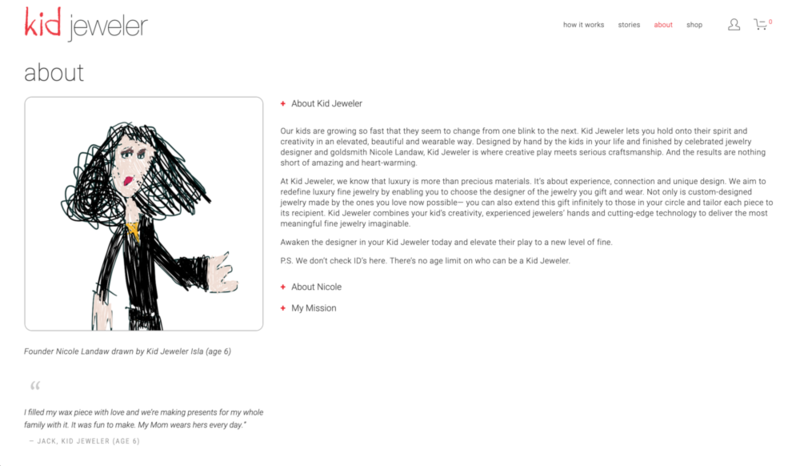 It was a pleasure working with Lizanne to build my website, kidjeweler.com. I was very hands-on for the project and she was excellent at taking me through all the possibilities of every nuance of my site build and guiding me with a gentle, considered hand. She was a poised, practical and willing partner even through several design challenges. Her communication skills are excellent. I’m very happy with her work and I would work with her again in an instant.